BlackArts Racing's Caterham R500 took both the Supercar Class Win and Overall Win in the SEC series 6 Hour Endurance race yesterday at Guangdong International Circuit. On Sunday, the Caterham R500 of BlackArts Racing's Bill O'Brien [USA], copiloted by Thang Kim 'Rich' Pham [VN], Scott Wrayton [GB], and Rob Webb [AU] dominated the third round of the Super Endurance Championship with not just another victory in the Supercar Class, but also the Overall Win for the 6 hour race. After the team placed fastest in practice and qualifying, O'Brien started the race on pole and took a commanding lead from the outset. After an hour, the race was red flagged due to a heavy downpour and restarted after twenty minutes, but with the combination of stellar driving by O'Brien/Webb/ Pham/Wrayton and fast pit stops by the BlackArts Racing crew, the Caterham held the lead for much of the race to cross the checkered flag more than 25 seconds ahead of P2. With competition from other high performance race cars such as the BMW M3 and SEAT TCR, BlackArts Racing showed that the dominant win was well deserved. 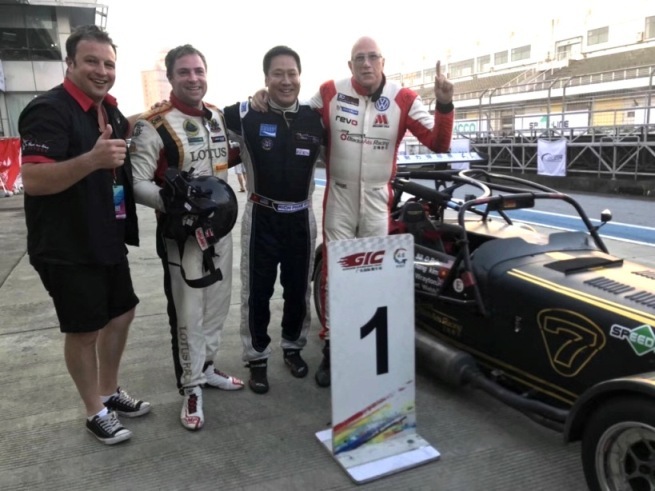 With Sunday marking the second class win for BAR in the Super Endurance Championship, after the 4 hour Round One on May 2nd, the championship will conclude at Guangdong International Circuit on December 31st with a grueling 12 Hour race. BlackArts Racing will enter the Caterham R500 in the 12 Hour event with the goal of another overall win.